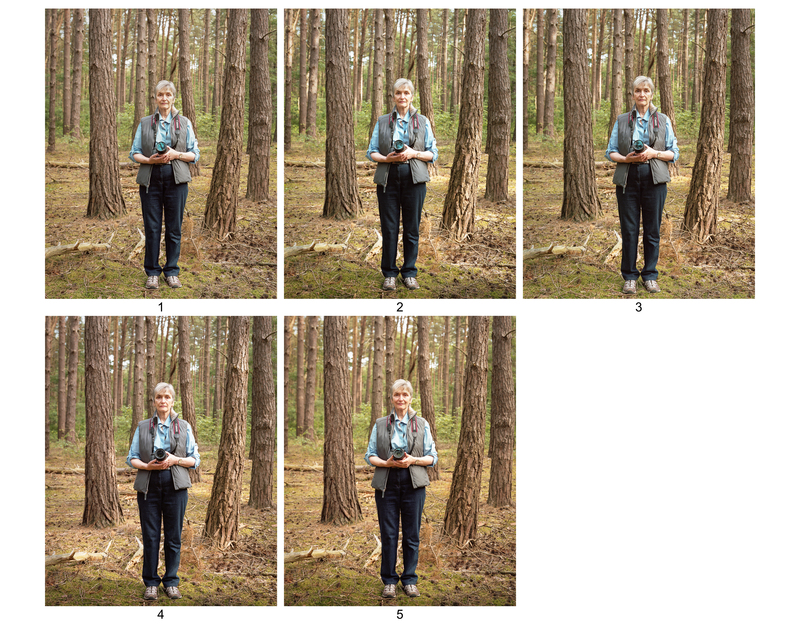 I have been revisiting the contact sheets for my Women and Landscape photographs. I was struck by the subtle differences in the poses of the four women I have photographed so far and I wondered if this arose because of my editing or because how I and my subject interacted on the day. In terms of body language Catherine has remained in the same pose throughout. This was despite the fact that with the view camera I had to change the double dark slide each time. I also checked the focus, exposure and framing each time I had to put in a new double dark slide – after each pair of shot with a single dark slide. This would have taken me a couple of minutes – the process with a view camera is slow and deliberate. In these full length shots it is hard to get a good impression of Catherine’s facial expression. The one thing which hits me though is that in image 5 she has clearly got a warmer smiling expression. What is also striking is how the light on the trees in the background is changing. Here the differences in expression are more clearly seen. As I said above in image 5 Catherine is clearly smiling. In images 3 and 4 she has a rather sad slightly fixed expression and her eyes are not as sparkling. In images 1 and 2 she appears to me to be more focused and less fixed. What is also clear is the way in which the lighting has changed and images 1-4 there is more shadow on the right side of Catherine’s face. This will undoubtedly lead to her expression being interpreted differently with perhaps a more moody feel. Image 5 has more warmth in the image too. As I recall the sun was moving in and out of clouds and for image 5 it was clearly shining. 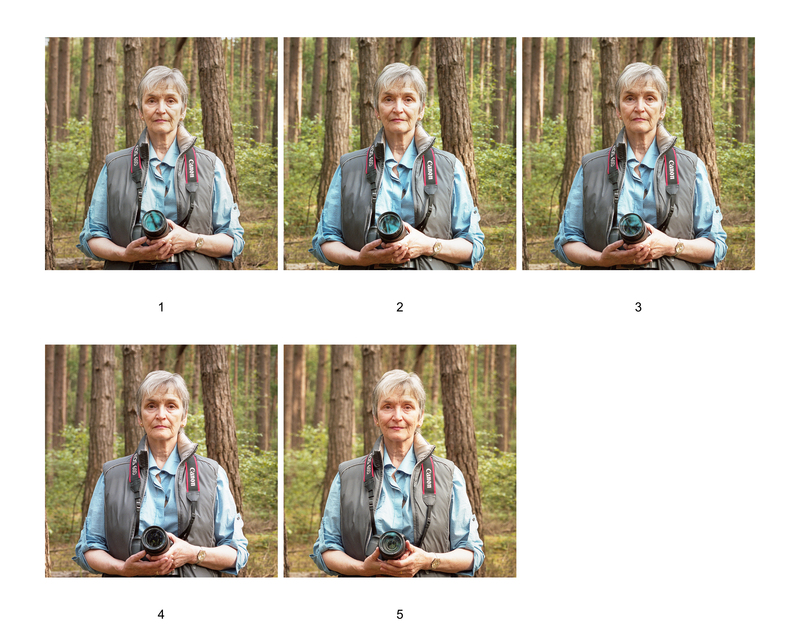 This analysis confirms what I have informally recognised all along, which is that I need to shoot a series of images so that I have options to select from for the final edit. I also need to slow down the process further and allow the subjects to relax in between to avoid their expressions becoming fixed. Which one is my favourite. Well number 5 is the warm Catherine I know, but I think number 2 is the determined Catherine that I also know and this fits better I think with the series I am producing. My thanks to Catherine for volunteering to support me in my project and I hope you forgive me for this detailed scrutiny!! I’m fine with that Keith. Further thought re the postures etc – I did relax as time went on, and felt most relaxed in the other image where I was seated and felt more in tune with the environment. However your choice of image needs to fit with your concept and deal with the techical issues you referred to above so your view as photographer is what’s important. Thanks Catherine…I may yet use the other image. It is not as striking but it does show one of the locations which you have photographed. Early days yet. It will also depend on how the series balances out.